Finish! is Daniel A. Moore's tribute to Alabama's 16th National Championship featuring Kenyan Drake diving into the end zone for a touchdown culminating from his 95-yard kick-off return. 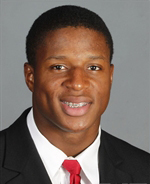 Autographed Editions Available: Each Autographed print or canvas has been personally signed by Kenyan Drake. Each limited edition print is hand-signed and numbered by the artist. The Regular Edition Lithograph is limited to 2015 prints, the Artist’s Proof Lithograph is limited to 400 prints, the Collector’s Edition Giclée is limited to 150 prints, and the Museum Edition Giclée is limited to 100 prints. Each print has an image size of 19½” x 26” image size — if framed 32" x 37" total size. Please allow 7-10 business days for completion of custom-framed orders.